Early am view of Summerhaven on Mt. Lemmon - looks like a couple of inches of wet snow up there. 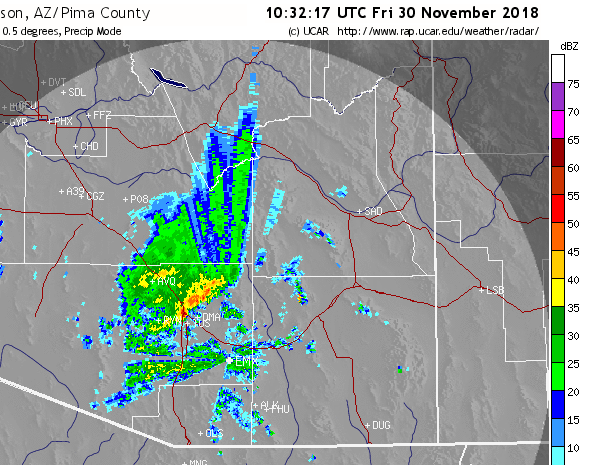 Most of sites in the Pima County ALERT network had 0.04" (above north portion and below south portion), or more, during the early morning hours - amounts at low elevations heaviest (1/3 to 1/2 inch) on west side of Catalinas out west toward Marana. Generally QPF amounts were well forecast by GEFS plumes (previous post). The Airport had thunder and 07" during 15 minutes before 04:00 am MST (timing very well forecast by all models), while DM had thunder and 0.10". Here at house there is 0.17" in the gauge - don't know if there was thunder here (lightning and radar seem to indicate yes). Radar (base scan) from NCAR RAP at 3:32 am this early morning. Models were extremely accurate for this event, from Tuesday night on - very impressive performance. Below is CG flash density (from wetaher.graphics and Vaisala) for 24-hours ending at 05:00 am, showing most CG flashes occurred over metro area and Catalinas. 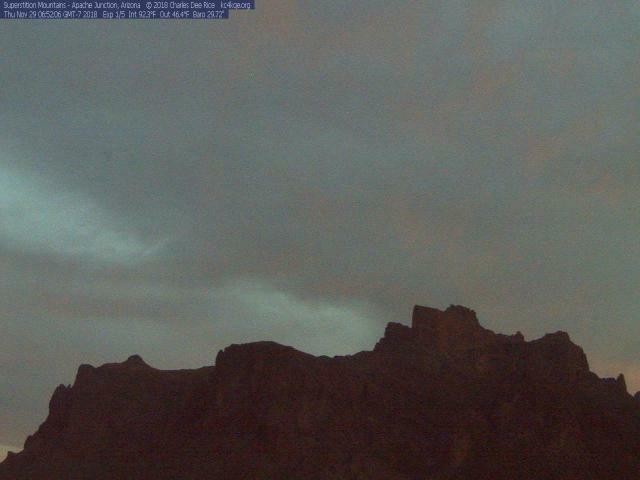 Sunrise over the Superstition Mountains east of Phoenix (from Jack Hales web cam wall). This morning the MIMIC toal PW analysis (above for 12 UTC) shows core of system approacging San Francisco. There is a distinct river of higher PW along the system's front, and light rains are already occurring over LA Basin. Model forecasts for PW at TUS jump it up to about 3/4 inch during frontal passage after midnight tonight. The QPF plumes from 06 UTC GEFS (above - blue is operational GFS and balck is forecast mean) show all the members in tight agreement, with 100% of the runs producing a brief period of rain and about 0.20" at the airport. Forecast below (from the 06 UTC WRF-NAM) of composite radar echoes is valid at 03:00 am MST early tomorrow - note that model forecasts some echoes to have quite strong reflectivity cores. The forecast skew-T for TWC (second below) is for 02:00 am. CAPE is quite small and strong echoes are likely due to graupel forming in the 700 to 500 mb layer. Slightly more CAPE, however, would lead to some nocturnal thunder with the front. The GFS version of WRF was wetter yesterday but today the NAM version is wetter. The NAM forecasts 0.3" at airport, while GFS version forecasts only a Trace. Compared to the GEFS forecasts above, WRF-NAM is wetter than any member, while WRF-GFS is a very dry outlier. 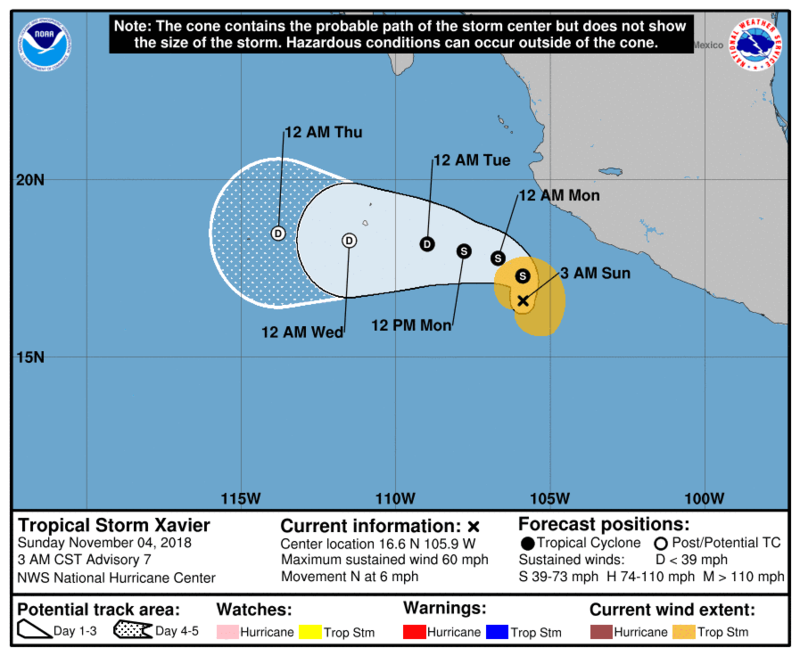 Tomorrow morning we'll know which model came closest. 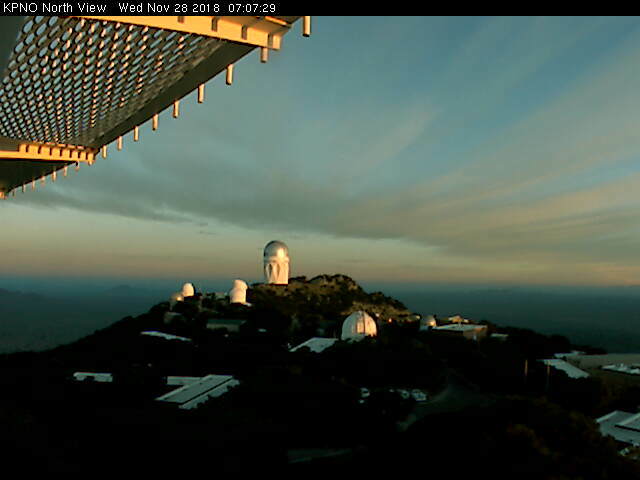 Sunrise this morning at Kitt Peak. Forecast models have little change today and indicate that fast-moving system will cross Arizona tomorrow night (Thursday the 29th). Graphics here are from the 06 UTC WRF-GFS forecast run last night. Above is composite radar images valid at 03:00 am MST early Friday - model forecasts a single band of showers to cross metro area, so amounts may be quite variable. Forecast below is for total precipitation through midnight, Friday night (color bar shown previous post). Bottom is 10-m wind forecast valid at 08:00 pm tomorrow evening and indicates a period of gusty, southwest winds late in afternoon into evening. A fast moving short-wave and attendant Pacific cold front will sweep across Arizona tomorrow night into Friday morning. The system will bring a chance of light showers and a considerable cool-down for the end of November. Above is GFS forecast for 500 mb level valid at 12 UTC Friday morning, November 30th. The GEFS plumes from 06 UTC - below - all forecast measurable rainfall at the airport during the early hours of Friday morning. The range in amounts goes from 0.02" to 0.42" with mean of 0.18". Second below is 06 UTC WRF-GFS forecast of precipitation through 11:00 am MST on the 30th. The NAM version forecasts just a Trace at airport. Whatever we get here will also be the November total rainfall, and then into a new month that will start out more unsettled than most of November. We've been away a couple of days and I'll do a quick post as we enter the last week in November. Even though the leaves are mostly gone, there was a bit of sunrise color in Winslow yesterday - with raven. 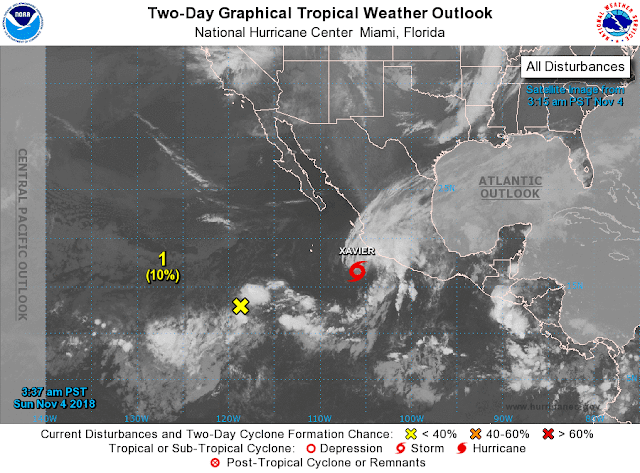 There has been absolutely no precipitation here at house since October 23rd, and big question now is whether November will close out at zero rainfall. Forecast below (from 00 UTC WRF-GFS on 5.4 grid) for total precipitation through 5:00 pm MST on December 2nd shows the operational GFS says no - even though much of West is forecast to be quite wet. Wait and see. Satellite images from GOES 17 (above visible for 2100 UTC and below IR for 2345 UTC) are from NESDIS RAMM Branch at Colorado State Univ. Images show a thick mass of high clouds that are heading our way from low-latitudes. Hope all who visit here have a good Thanksgiving weekend. The big winter storm in the east has been the weather focus last couple of days. 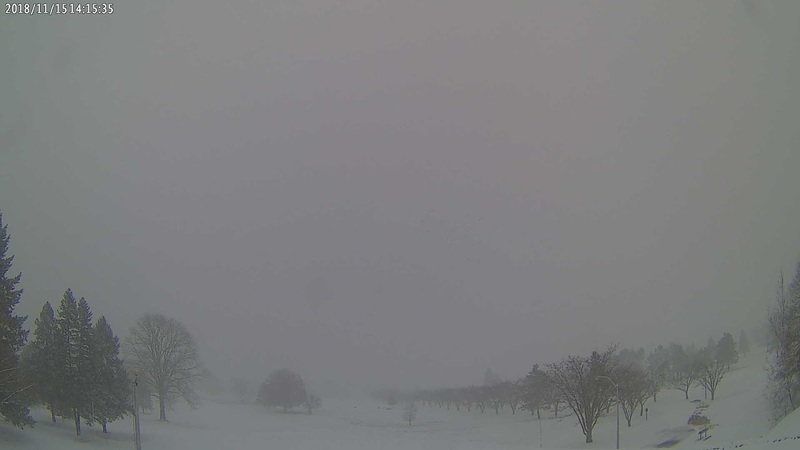 Above is view of Penn State golf course yesterday morning. Below is somewhere in northern New Hampshire this morning. Locally there has been no precipitation in over three weeks and week ahead looks to be dry and mild. Above is 00 UTC WRF-GFS forecast on 5.4 km grid of precipitation through 5:00 pm MST next Friday the 23rd. Below are the GEFS plumes for airport - precipitation and then temperature. Above graphic shows observations at Mt. Hopkins RAWS site from noon to midnight yesterday (columns from left to right: time, solar radiation, ave mph last hour, ave. direction, max gust last hour, and temp). Note that 3 hours had max gusts over 85 mph - my outlook in previous post ended up a bit low on the gust potential up there. Here at house max gusts were around 50 mph and airport reached up to 40 mph. The winds at TUS were strongest for any of the ASOS, southeast Arizona stations listed on NWS web site. Long-range models forecast a bit of a pattern change next week just before Thanksgiving - but of course that's a long time from now. 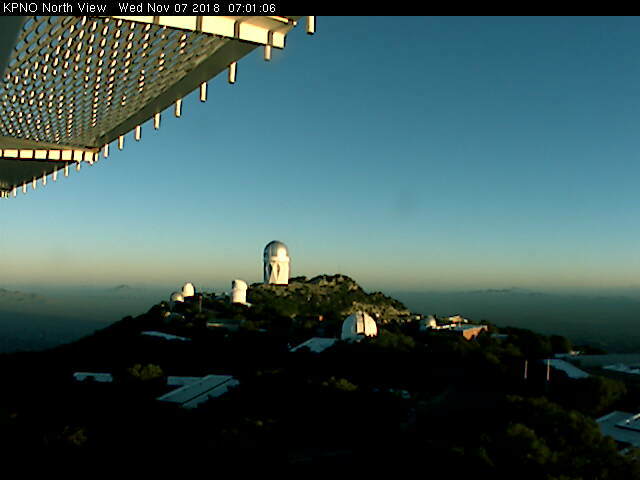 Wind trace for today (above) from Kitt Peak 4-m telescope - quite nasty out there (as I've said before, the locations of the weather stations there is not known to me, and there could be considerable structure effects involved with the high wind speeds). Locally, it has been very windy down the Rillito Wash area. Based on the activity of our largest wind chime and the trees, I estimated gusts 35 to 40 mph earlier this morning. But I walked at mid-morning and it wasn't fun. I could barely stand up heading east into wind on Allen St. So I upped my estimates to at least 50 mph here in our part of City. Numerous trash and recycle bins blown over, with much trash blowing westward along Allen. The winds at airport are gusting 35 - 40 mph, almost double that of the current morning forecast. I checked the current grid point forecast for the airport and it is way off. Strongest winds in that forecast are 20 mph (tailing off to 14 by midnight) with no gusts forecast. Mt. Hopkins has just been 45 to 50 mph, but the morning WRF forecasts still bring the winds near mountain top more easterly, so it is likely the gusts will increase up there. The winds setting up during the night kept temperatures quite a bit warmer locally than they were Monday morning. After a low of 30 F yesterday here, low this morning was 44 F. The airport had 33 F yesterday and 42 F this morning. 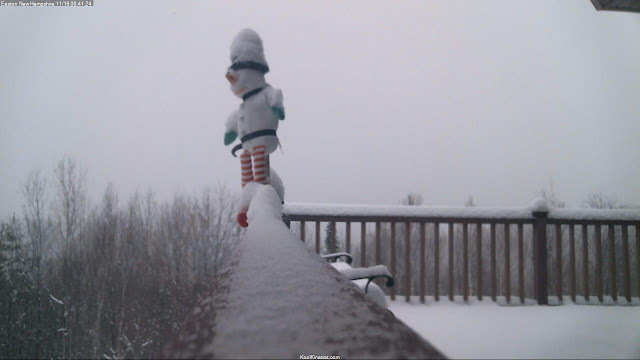 As strong, cold outbreak has moved south down the Front Range, it has left behind several inches of snow. 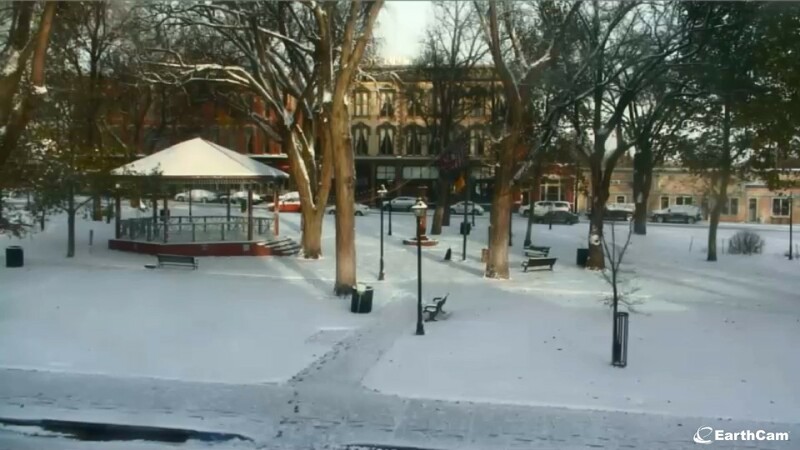 View above is from Las Vegas, New Mexico, this morning, looking across the park to the historic Plaza Hotel. At bottom is photo taken by our neighbors, the Ferner's, of smoke somewhere over southern California on Saturday morning. They were on a direct flight from SFO to TUS. Models continue to forecast a significant windy period that will feature gusty, easterly winds over southeastern Arizona from this afternoon into Wednesday. Forecast above is from 06 UTC WRF-NAM for 10-m winds at 09:00 pm MST tonight. Forecast below (from same model run) is for Sonoita skew-T valid at 05:00 pm tomorrow afternoon. Sonoita is almost directly east of the gap in the Santa Ritas that leads to very strong winds at the Mt. Hopkins RAWS site. The forecast soundings at this location indicate a very strong wind event there, with winds beginning today and extending into tomorrow night. The forecast soundings, if accurate, indicate winds at the RAWS site could gust in the 60 to 80 mph range. The system is also bringing our area the coldest temperatures of the Fall. Here at house the low dropped to 30 F, our first freeze of cold season (turned on the heating systems yesterday afternoon - first need to use either HVAC system in about six weeks). I see that Sasabe RAWS (off to the southwest of here) dropped down to a very cold 22 F this morning. Sunrise east of Sonoita yesterday morning. Bottom shows some fall color down there also with golden cottonwoods. The GEFS plumes for QPF at the airport - above - forecast another very dry week here in Tucson area. Winds early yesterday really did not materialize as per the WRF forecasts - probably due to very shallow nature of the push from the east. I found a few gusts to middle 20s in metro area - this was midway between WRF and grid point winds at airport. The WRF forecasts another east wind event for late tomorrow into Tuesday, with the easterlies/northeasterlies being much deeper. I'll update tomorrow am and won't jump for graphics this morning. 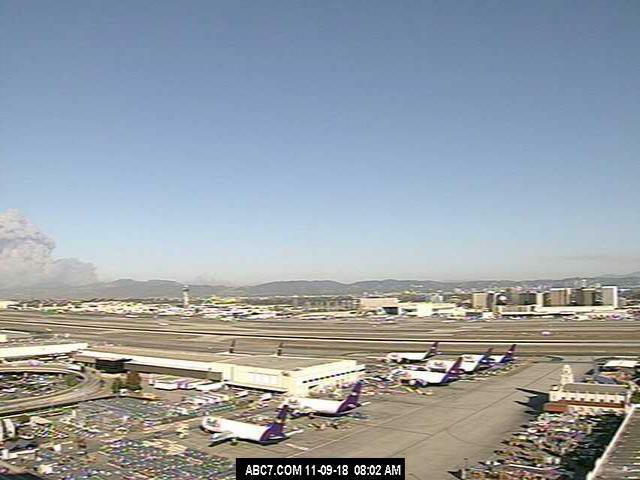 Webcam view from LAX early this afternoon. 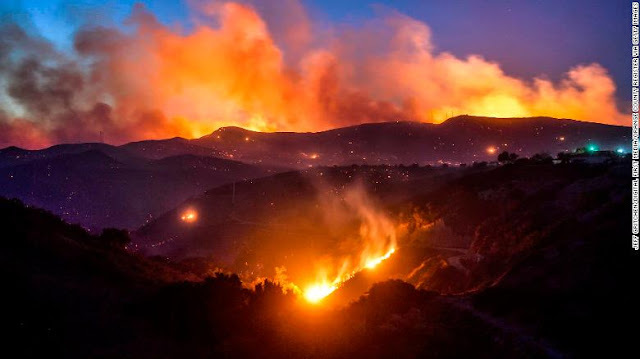 Three major wildfires in California, two in the L.A. Basin, are the focus of national news this morning - hundreds of structures burned and thousands evacuated. 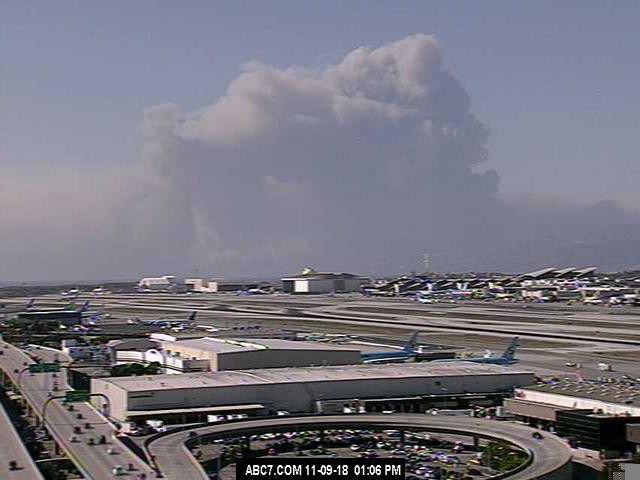 Photos here are in L.A. area this morning (bottom from Jack Hales webcam wall). In an earlier post I noted the differences in the 144-hour, operational 500 mb forecasts valid at 00 UTC today. Top is GFS, above is verifying analysis from SPC, and below is the ECMWF. Hard to subjectively evaluate the two forecasts. The ECMWF was definitely too strong in the West and slow over north-central U.S. The GFS was just the opposite. Average of both forecasts seems to verify best. As for the winds late afternoon into tomorrow am across the metro area, the high-res WRF forecasts continue to forecast strong east winds (above from WRF-GFS run at 06 UTC and valid at 10:00 pm), that would likely gust 30 to 40 mph. Meanwhile the NWS digital forecast (just below for the airport - updated around 7:00 am MST this morning) forecasts little in the way of local winds. In contrast at bottom is the WRF forecast of surface conditions valid at 10:00 pm tonight, indicating wind speeds of 20 to 30 mph across the metro. Will watch to see how this evolves.